Norwalk Police Sgt. 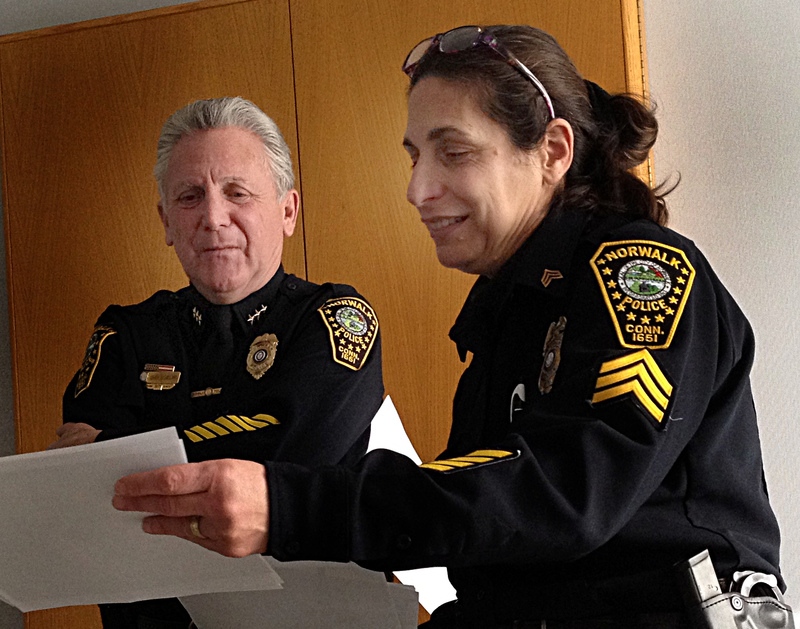 Lisa Cotto shares a document with then-Norwalk Police Chief Harry Rilling in 2012. Press briefings with Cotto are usually lively and informative. NORWALK, Conn. – Apparently, not everyone in Norwalk is a fan of Norwalk Police Sgt. Lisa Cotto. And when a citizen voiced a complaint directed at the sergeant, Mayor Richard Moccia immediately went on the defensive. “Mr. Peter Smith, 26 Hunters Lane, Norwalk asked who the press spokesperson was, and deputy chief replied that it was Sgt. Lisa Cotto. Smith stated that she does not come across very well, and her New York accent bothers him. He said he feels the Police Department could find someone without such an offensive accent as a press person – someone without a Brooklyn accent that makes a better image. “Mayor Moccia stated that he finds this very offensive and that he takes exception to this personal attack of an officer and what should be important is the performance and dedication of the men and women that put their lives at risk every day in protecting our residents. Commissioner Torrano stated that he wanted to clarify Mr. Smith’s concern is with the presentation and not any behavior or actions on the part of the officer. Commissioner Torrano stated that he appreciated the comments and will make it a point to note this. Part of the discussion of a BlumShapiro Consultants presentation of a focused operating review of the Board of Education finances at Thursday’s Common Council Finance Committee meeting revolved around the $632,324 that was transferred from part of the Board of Education budget to the special education department in 2012 to cover deficits. Apparently they could not. But, instead of setting up an official contingency fund, figures were moved from item to item to cover shortfalls. “We did argue occasionally from the city side that a contingency was necessary,” Kimmel said. “But the folks from Board of Ed believed, well, it would be the first thing we would cut in the reconciliation process. We would just be going around in circles. “The other possibility was going the special appropriation route. But there was hesitancy to go that direction because the relationship between the Board of Ed and the city wasn’t that good. “We found ourselves, as a result, in a situation. No contingency. Expenses that could fluctuate so we needed money somewhere. We had to find it, whether it came from insurance or other accounts. The fact of the matter, what could be looked at as troubling, was that that money was there to be had. “If not for the insurance issue, which we have gone through, if there were other accounts where there is money to be had — I guess you would call padded accounts — to deal with whatever emergencies were near. The budget review covered fiscal years from late 2009 to spring 2012. I think we should require all female City of Norwalk personnel spokeswomen to sound like Jessica Rabbit and, while we are at it, let’s ensure that no male spokesman is respected, trusted or believed unless they sound like Clint Eastwood. First let me say I find it comical that someone is concerned with someone’s accent. With that said I find it very offensive and I take exception to this personal attack of a taxpayer by the mayor. This mayor seems to be under the misconception that the taxpayers work for him and not the other way around. The taxpayers are the mayor’s employer and how dare he speak to his employer as he did. In the real world as in the private sector if one spoke to their employer in this fashion they would be fired. Also I wonder if the mayor would go to the same lengths for a convenience store clerk, roofer or a cab driver as they are truly the ones that put their lives on the line every day for us, as police are not even in the top ten of most dangerous job. Mr. Mayor you can stop sucking up to the police union for that coveted endorsement as I am sure you have it in the bag after promoting a chief from the old boys club with ZERO search for the best candidate. The funny thing is the endorsement is useless as most of the cops don’t live in town thus making it impossible for them to vote in Norwalk. If that is the worst complaint ever made against Sgt.Cotto, she must be doing something right, and should be commended. Sgt. Cotto, reached for comment, said she had no eyedea what Mista Smith was tawking about. All kidding aside, I have spoken with Sgt. Cotto. I don’t have a clue as to why this guy is complaining. She speaks well, she is kind and helpful, and we are lucky to have her on the force. Inquiring minds must know so I sent Sgt. Cotto an email and asked where she is from. She said, “Dad’s family from Bensonhurst, Brooklyn; Mom’s family from Rockaway, Queens. Unfortunately it’s in black and white so we are bereft the sound of her voice! For more information watch Channel 12. She’s sure to pop up eventually! I actually like the New York accent. Seriously? Councilmen asking tough questions about a million dollar shortfall and everyone’s worried about the accent?